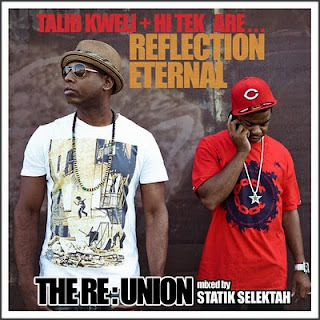 DJ Hi-Tek and Kweli new album, Revolutions Per Minute is coming VERY soon. I know the true fans have been holding their breath anticipating the release. To hold y'all down until then, ShowoffHipHop.com & Yearoftheblacksmith.com bring you this mixtape, The RE:Union (mixed by Statik Selektah). The project consists of new joints, classics, and unreleased songs. Click the link below to get this mixtape on your ipod. Thanks for the post. I'm going to download this soon as I get home from work. I love Kweli. He can get it anytime:). Thanks for the download, can a fan get the album for free also? Just kidding, I'll support REAL HIP-HOP. Cincy STAND UP!!! !